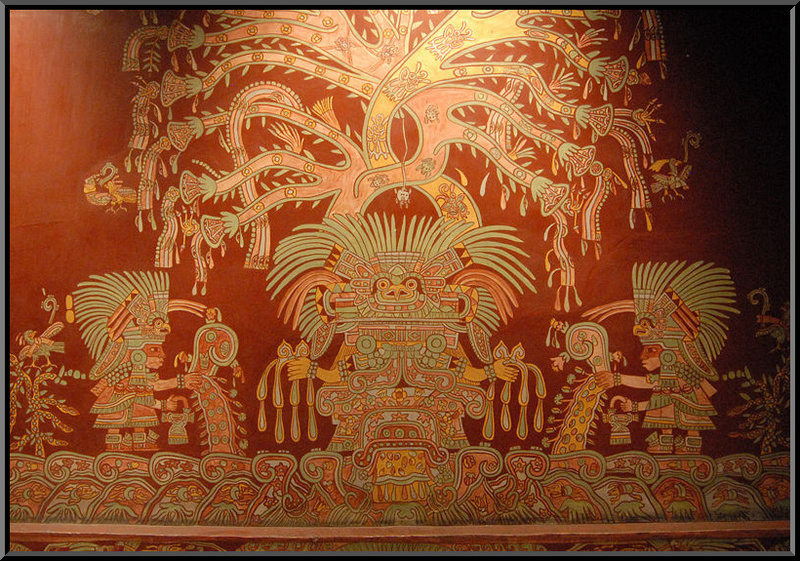 Orignating in the Yucatan around 2600 BC, they rose to prominence around 250 AD in present day southern Mexico. Building on the inherited inventions and ideas of earlier civilizations such as the Olmec, the Mayans developed astronomy, calendrical systems and hieroglyphic writing. The Mayans were noted as well for elaborate and highly decorated ceremonial architecture, including temple-pyramids, palaces and many observatories, all built without any metal tools. They were also skilled farmers, clearing large sections of tropical rainforests and where the groundwater was scarce, building sizeable underground reservoirs for the storage of rainwater. The Mayans were equally skilled as weavers and potters and cleared routes through the jungles and swamps to foster extensive trade networks with distant peoples. Many believe that the ancestors of the Mayans crossed the Bering Straits at least 20,000 years ago, they were nomadic hunter-gatherers. Evidence of settled habitation in Mexico is found in the Archaic Period of 5000-1500 BC. - corn cultivation, basic pottery and stone tools. The first "True" civilization was established with the rise of the Olmecs in the Pre-Classic Period of 1500 BC to 300 AD. 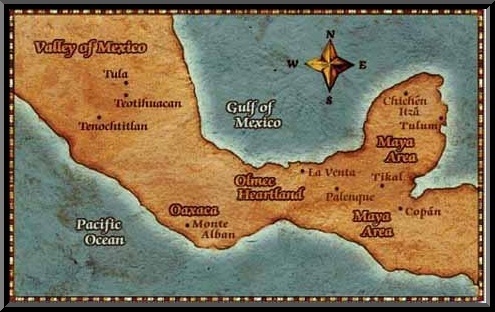 The Olmecs settled on the Gulf of Mexico Coast and little is known about them. The Mayans are regarded as the inventors of many aspects of Mesoamerican cultures including the first calendar and writing in the Western World. Archeologists have not settled the relationship between the Olmecs and the Mayans and it is a mystery whether the Mayans were their descendants, trading partners or had another relationship. It is agreed that the Mayans developed a complex calendar and the most elaborate form of hieroglyphics in America, both based on the Olmecs versions. The Mayans seem to have entered the Yucatan from the west. As usual with ancient nations, its difficult in the beginning to separate myth from history, their earliest mentioned leader and deified hero, Itzamna, being considered to be simply a sun-god... common to the Mayans. He is represented as having led the first migration from the Far East beyond the ocean, along a pathway opened through the waters. The second migration, which seems to have been historic, was led from the west by Kukulcan, (left) a miraculous priest and teacher who became the founder of the Mayan kingdom and civilization. Good authority has this based upon the study of the Mayan chronicles and calendar beginning near the close of the second century of the Christan Era. Under Kukulcan, the people were divided into four tribes ruled by as many Kingly families; the Cocom, Tutul-xiu, Itza, and Chele. 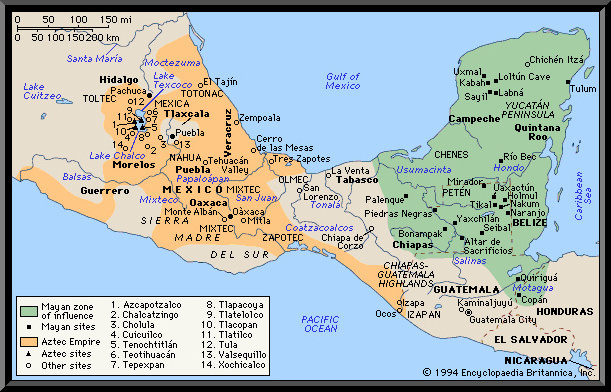 The Tutul-xiu held vassal rule at Uxmal, the Itza at Chichen-Itza, and the Chele at Izamal. To the Chele was appointed the hereditary high priesthood and their city became the sacred city of the Myans. Each provincial King was obliged to spend a part of each year with the monarch at Mayanspan. This tradition continued up to the eleventh century when, as the result of a successful revolt of the provincial Kings, Mayanspan was destroyed and the supreme rule passed to the Tutl-xiu at Uxmal. Later on, Mayanspan was rebuilt and was again the capital of the nation until the middle of the 15th century when, in consequence of a general revolt against the reigning dynasty, it was finally destroyed and the monarchy was split uo into a number of petty states of which 18 existed on the peninsula at the arrival of the Spaniards. 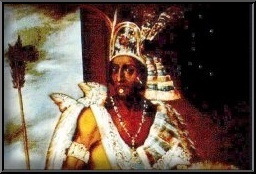 In consequence of this civil war, a part of the Itza emigrated south to Lake Peten in present day Guatemala where they established a kingdom with their capital and sacred city of Flores Island in the middle of the lake. Most artistic and cultural achievement came about during the Classic Period 300 to 900 AD. The Mayans developed a complex hierarchical society divided into classes and professions. Centralized governments headed by a King, ruled territories with clearly defined boundaries. These borders changed as the various states lost and gained control over territory. Mayan centers flourished in Mexico, Guatemala, Belize, Honduras, and El Salvador. The major cities of the Classic Period were Tikal (Guatemala), Palenque and Yaxchilan (Chiapas, Mexico), Copan and Quirigua (Honduras). For most of this period, the majority of the Myan population lived in the central lowlands of Mexico and Belize. The Northern Yucatan (where present day Cancun is located) was sparsely populated for most of the Classic Period with only a few cities such as Dzibilchaltun (near Merida) and Xpuhil, Becan and Chicanna (near Chetumal). During the 9th century the population centers of the central lowlands declined repidly and was attributed to famine, drought, breakdowns in trade and political fragmantation. As the cities in the lowlands declined, urban centers sprung up in the Northern Yucatan, including Uxmal (near Merida). Anthropologists used to contrast the "peaceful" Mayans with the blood-thirsity Aztecs of central Mexico. Although human sacrifice played a major role in their religion. Individuals offered up their blood, but not neccessarily their lives to the gods through painful methods using sharp instruments such as sting-ray spines or performed ritualistic self-mutilation. It is probable that people of all classes shed their blood during their religious rites. The King's blood sacrifice was the most valuable and took place more frequently. The Mayans were warlike and raided their neighbors for land, citizens and captives. Some of the captives were subjected to the double sacrifice where the victims hearts were torn out for the Sun God and the head cut off to pour blood out for the earth. The Mayan civilization was at the height of the pre-Columbian culture. They made significant discoveries in science, including the use of the zero in math. The writing was the only one in America capable of expressing all types of thought. Glyphs either represent syllables or whole concepts and were written on long strips of paper or carved and painted on stone. The Mayan calendar begins at 3114 BC, before Mayan culture existed and could measure time well into the future and astrological events as well. Fray Diego de Landa, second bishop of the Yucatan ordered a mass destruction of all Mayan books in 1562 and only three survived. After the Classic Period, the Myans migrated to the Yucatan peninsula. 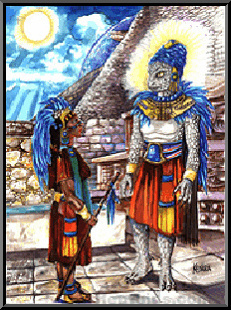 There, they developed their own char-acter, although their accomplishments and artwork are not considered as impressive as the Classic Mayans. Nost of the ruins seen south of Cancun are from this time period. Chichen Itza, Uxmal and Mayanspan were the three most important cities during the Post Classic Period. They lived in relative peace from around 1000 to 1100 AD when Mayanspan overthrew the confederation and ruled for over 200 years. In 1441, the Mayans who had previously ruled Uxmal, destroyed the city of Mayanspan and founded a new city at Mani. 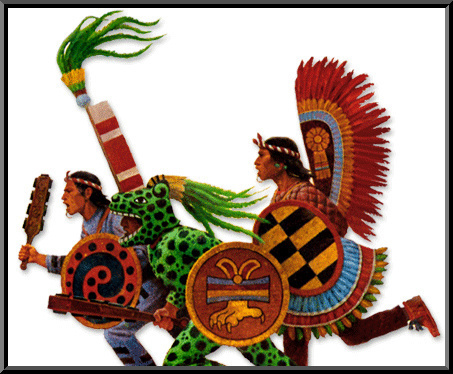 Wars were fought between rival Mayanspan groups over the territory until the region was conquered by the Spanish. Chichen Itza was first populated between 500 and 900 AD by the Mayans and for some reason abandoned around 900, the city was then resettled 100 years later and then invaded by the Toltecs from the North. There are numerous reliefs of both Mayan Gods, including Chac and the Toltec Gods including Quetzalcoatl. For some reason the city was abandoned around 1300. If the Spanish had not made it policy to kill all the Mayan Priests and burn all their books when they arrived in Mexico, we would all have more answers. The Popol Vuh "Council Book"
Hunahpu (Junajpu) and Xbalanque (XbEalanke). The second part of the book deals with details of the foundation and history of the Quiche kingdom, tying in the royal family with the legendary gods in order to assert tule by divine right. The book is writen in the Latin alphabet but is thought to have been based on an original Maya codex in the Mayan hieroglyphic script. The original manuscript which was written in 1550 has been lost but a copy of another hendwritten copy made by the Friar Francisco Ximenez in the early 18th century exists today in the Newberry Library in Chicago. The significance of the book is enormous since its one of a small number of early Mesoamerican mythological texts, it is considered the single most important piece of Mesoamerican literature. 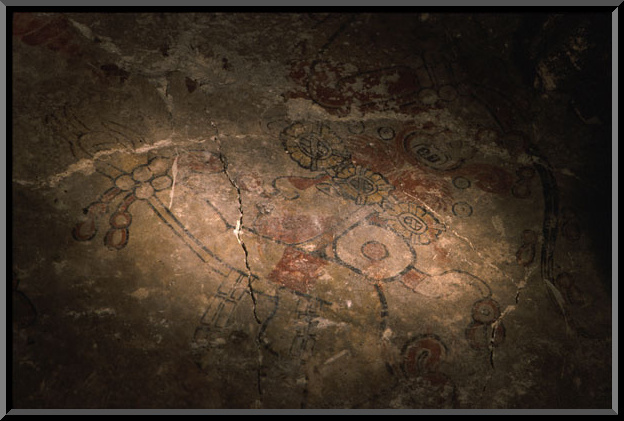 The Mythology of the Quiche is believed to correspond closely to that of the Pre Classic Maya as depicted in the San Bartolo Murals, and iconography from the classic period often contains motifs that are interpretable as scenes from the Popol Vuh. "There was only immobility and silence in the darkness, in the night. green and blue feathers and were therefore called Gucmatz........."
that when dawn would break, Man must appear"
and the creation of Man"
"Thus it was arranged in the darkness and in the night by the Heart of Heaven who is called Huracan. The first is call ThCaculha Huracan.e second is Chipi Caculha. The third is called Raxa Caculha. and these three are the Hearts of Heaven. They came together in darkness to think and reflect. for the creation of Man. of our first mother and father. Their flesh was nade of white and yellow corn. The arms and legs of the four men were made of corn meal. The Teotihuacan Spider Woman was a goddess of the Pre-Columbian Teotihuacan civilization Maya, in what is now Mexico. In 1942, an interesting discovery was made when a series of murals was found in the Tepantitla compound in Teotihuacan. While many of these murals simply depicted scenes of everyday life in amcient Teotihuacan and some simple Mesoamerican figures, a few contained paintings of a previously unknown deity. To this day, no one has found any evidence of her name. Although often referred to as the "Great Goddess", Karl Taube is the first to appropriately christen her the "Teotihuacan Spider Woman" in his article in the 1983 edition of The Journal of Latin American Lore. The Tepantitla compound was a kind of apartment complex for what appears to be some very high status citizens. The walls are adorned with brightly painted frescoes fit for royalty. There are two nearly identical murals at this site, separated by a doorway, that illustrate the Spider Woman. In them, she stands with outstretched arms between two smaller female attendants and in front of two tall interwoven vines filled with both spiders and butterflies. At her base is a mirror bowl spilling what appears to be a mixture of water and seeds. 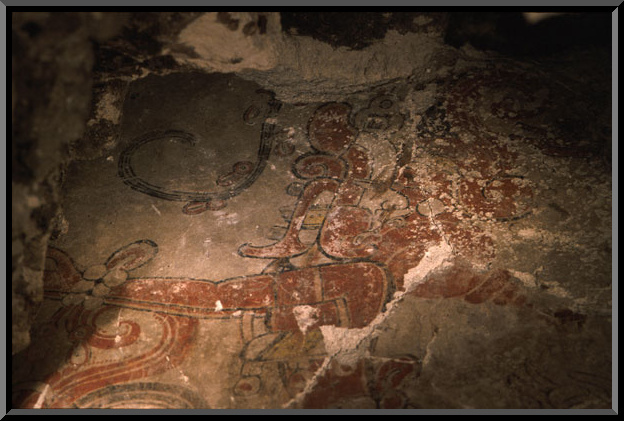 These murals were painted in beautiful, vibrant colors and have been relatively well preserved. Due to the highly stylized quality of Mesoamerican art and often to its poor preservation, it can be difficult to determine the gender of a painted or sculpted figure. Also, the ancient people of these areas wore heavily layerd clothing that often added to the confusion. 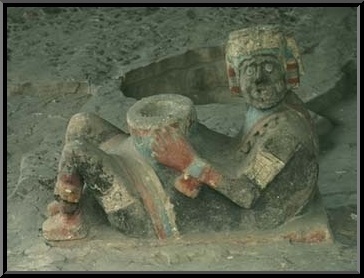 This being the case, archaeologist Alfonso Caso mistakenly identified the central figure in the Tepantitla murals as Tlaloc the Mesoamerican god of rain and warfare. Several decades passed before this mistake was caught. Futher examination eventually revealed that the wardrobe worn by the two female attendants was also visible on the main figure. This belated discovery finally established the Spider Woman's femininity. The Teotihuacan Spider Woman has since been found at several other sites, sometimes in murals, and sometimes in sculpture or figure form. Her most obvious trait is simply the fact that she is female, but she does have several other recognizable qualities to help archaeologists identify her. The Great Goddess wears a frame headdress that often includes the face of the jaguar and has a medallion in the center on which an Owl is usually depicted. She will also be shown among several spiders and is frequently seen with a yellow body coloration, futher distinguishing her from other Mesoamerican deities. Her single most recognizable feature however, is a distinguishable nosepiece. This bar is large enough to conceal her whole mouth, and is equipped with what appears to be arachnid-like fangs. The rectangle-shaped bar hangs from under her nose and usually has three circles on it. Immediately below these circles hang three fangs. The two outer fangs curl to point away from the center, while the middle fang just comes straight down looking like the letter U. The overall effect is an otherwise plain Mesoanerican goddess with a frighteningly spider-like appearance. The Spider Woman is now thought to have been a goddess of the underworld, darkness, the earth, war, water, and possibly even creation itself. To the ancient civilizations of Mesoamerica, the jaguar, owl and especially the spider were considered creatures of darkness, often found in caves and during the night. 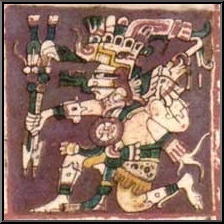 The fact that the Teotihuacan Spider Woman id frequently depicted with all of these creatures futher supports the idea of her underworld connections. Jaguars are also surprisingly good swommers and are often found near ponds and small lakes, providing the idea that the Great Goddess is also related to water. It was also very common amongst the ancient Mesoamericans to associate jaguars with warfare. This is probably the most obvious symbolism suggested for the big cats, provided their predatory nature, mighty jaws, powerful musculature and huge claws. The other animal commonly seen in the goddess's headdress is the Owl, providing another reason the Spider Woman is thought to have been a goddess of darkness. The owl is one of the most recognizable nocturnal creatures and was believed to be a messenger for the lords of the underworld. Burrowing owls were also common living in old prairie dog burrows, futher suggesting their relationship to caves and the underworld. In numerous cultures throughout the world, the owl is a symbol of darkness, evil, sorcery and death, but also revered as magical and wise. Interestingly enough, the Spider Woman is not exclusively found in Mesoamerica. 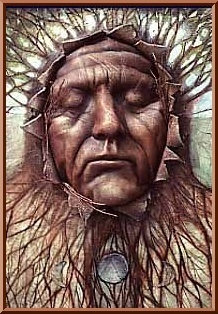 Some North American Indians in what is now the United States, such as the Pueblo and the Navajo worshiped a very similar deity. Referred to as the "Spider Grandmother" she shares many traits with the Teotihuacan Spider Woman. Although the idea of this diety originating in Mesoamerica is highly accepted, no one is really sure which culture she initially came from or how exactly she was passed from one to another. The advanced Mayan culture developed thanks to a complex synthesis of different culture streams arising from the home agriculture base, influenced by cultural values coming from regions lying out of the territory of Mayan settlement. Its forming falls to the so-called early phase of the initial period placed between 1500-800 BC. It was spread step-by-step to the regions of Guatemala, southeastern Mexico, Belize, Salvador and northwestern Honduras. The construction of beautiful cathedral cities, fine arts of sculpture and painting, use of their own hieroglyphic script, success in astronomy, existance of the literature and the development of handicraft and trade were the outer expression of this cultural-economic rise. The results of Mayan observations and calculations of astronom-ical phenomena are concentrated in the Dresden Codex It is a band of paper 3.5 meters long set up into 39 sheets making up 78 pages 8.5 x 20.5 cm. The paper was obtained from the bark of wild-growing species of fig tree. It is thought to orignate from the Yucatan as a latter transcription of an elder orignal. It contains calendrical data written in the Mayan dating system. 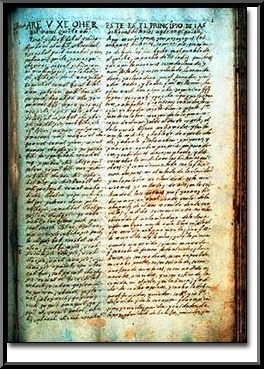 The data contained in the Dresden Codex were studied by many researchers who suspected they contained astronomical data. M. Meinshausen (1913), C.E.Guthe (1921) and H.Spinden (1930) were the first who had been interested in the eclipses tables. E.Foerstemann has drawn attention to the Venus visibility ephemerides tables he also issued the Dresden Codex with a commentary in 1892. The analysis of these ephemerides has been made by J.E.Teeple (1926). R.W.Wilson believed that some of the data could concern the observations of Mars, Jupiter and Saturn (1924). These researchers and lots of others, worked with the calcul-ation coefficients of 584,283 or 584,285 days accordingly to Goodman-Martinez-Thompson when converting the Mayan dates into the Christian dating system, or tried to calculate their own coefficient. For this reason their conclusions were very diverse. One of the most important problems during the studies of various Mayan culture phenomena had been the problem of correlating the Mayan to our Christian dating system. In present times, we are used to correlate the Mayan dates with the Christian ones using the Goodman-Martinez-Thompson correlation. According to it, a stable coefficient of 584,283 or 584,285 days is added to the Mayan dated expressing the counts of days which have passed from a particular day to the date of a certain event. The Mayan date is converted into a Julian day number and the latter finally to the corresponding day, month and year of the Julian calendar used in modern astronomy. Working with the data of the Dresden Codex it has been found that the Goodman-Martinez-Thompson correlation is unusable, even for the dates concerning certain astronomical phenomena such as the observations of Venus visibilty, or Sun and Moon eclipses. We have obtained a new coefficient of 622,261 days for the conversion of the Mayan dates to our own dating system by a complete analysis of the mutual relations between the time intervals of all the Mayan dates in the Dresden Codex and 400 inscriptions from the cathedral cities. Using the so called B hm correlation coefficient, it was successful in proving that all the data in the Dresden Codex are concerning astronomical phenomena. 1. The observations of Venus visibility, when it had appeared for the first time after its conjunction with the Sun as a morning star shortly before sunrise, or after its upper conjunction, when it had appeared as an evening star shortly after the sunset. 2. The observations of Mercury visibility, its trajectory creates an eccentric ellipse. This eccentricity, the synodic circulations of the planet lasts from 104 to 132 days. The average length of the synodic circulation is 115.877484 days. The cinsiderable proximity of the planet to the Sun makes its glow suppressed by sunshine. For that reason, the Mayan astrononers could have observed it only when the planet gets to the greatest angle distance during its circulation around the Sun, so called elongation. It is the western elongation when Mercury rises over the horizon shortly before sunrise and the eastern elongation, when its briefly visable over the western horizon right after sunset. The maxium angle distances are as a rule moving between 18 to 23 degrees. The maxium elongation of 27 degrees and 49 minutes happens when this elongation visibile from the Earth runs during the epihelium, that means the greatest distance between Mercury and the Sun (Mercury gets there once for its sidereal circulation on its eccentric trajectory). The sidereal circulation is the real time of circulation of any planet around the Sun and it makes in this case 87,9693 days. During the perihelia (minimal distance from the Sun) is the maxium angle distance visible from the Earth 15 degrees and 55 minutes. It seems as if the planet stood in one place for 4-12 days in the time of maximal elongations. Its angle distance from the Sun changes between 1-2 degrees. This insignificant movement could not have been discovered by the Mayan observing methods. For that reason, their determination of Mercury elongations moves on average inside the borders of that "mistake." 3. The solar eclipses and the fullmoons and newmoons. 4. The observation of the heliacal risings and settings of the planets. The heliacal rise sets in after the planets conjunction with the Sun, when they are visible in the morning sky before the sunrise. During their heliacal setting, the planets are visible in the evening sky after sunset. In the period of conjunction, the planets are invisible for a few days. By observing the heliacal risings and settings dates, its able to determine the length of the synodic circulations of the planets. 5. The observation of the planetary conjunctions (when two planets observable from the Earth get in line and are nearly covering each other). The Dresden Codex is mostly describing only close approaches of the planets because some of the dates are calculated to the past and to the future. One of the worldwide three existing mayan codices (plus the Grolier fragment) to survive the book burnings by the Spanish clergy in 1521 turned up in Dresden in 1739. How it got to Vienna, where Johann Christian Goetze, director of the Royal Library at the court of Saxony purchased it from a private owner, is unknown, but it was probably sent by Hernán Cortés as a tribute to the king of Spain, who was also the king of Austria during the Conquest. The Dresden Codex is considered the most beautiful and complete. It is made from Amatl paper( "kopó", tree bark that has been flattened and covered with a lime paste) , folded accordion-style and written and painted on both sides. It totals 74 pages in length, painted with extraordinary care and clarity using a very fine brush. The artist used both sides of all but four of the pages of the codices. Its basic colors are red, black and the so-called Mayan blue. The codex was written by eight different scribes, each with their own distinctive style, type of glyphs and subject matter. It is linked to the Yucatecan Maya in Chichén Itzá, the extraordinary ancient Mayan city situated in the north of the Yucatán Peninsula. It was made between A.D. 1200-1250, and was still possibly in use when the conquistadors arrived. The "Codex Dresdensis" as one of the few pre-Columbian Mayan hieroglyphic writings (most of them on stelas found in Palenque, one of the ancient cities of Yucatán) contains astronomical calculations of exceptional accuracy. There are almanacs and day counts for worship and prophecies; two astronomical and astrological tables, one dealing with eclipses and the other Venus and katún (a 20-year period) prophecies. It contains references and predictions for time and agriculture, favorable days for predictions, as well as texts about sickness, medicine, and seemingly, conjunctions of constellations, planets and the Moon. It also contains a page about a flood, a prophecy or maybe a reference to the rainy seasons so vital to the Maya. The Maya's reputation as astronomers is based largely on these figures. 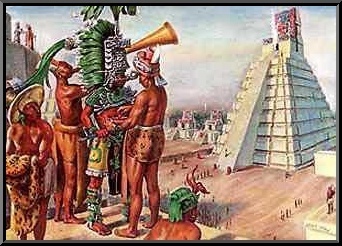 Somewhere in southern Mexico prior to 36 B.C., people had begun to use multiples of a 360-day year to produce a very accurate calendar for measuring long intervals of time. The Maya version of that calendar used as its starting point a date corresponding to August 13th, 3114 B.C., of the Western (Gregorian) calendar. Is is speculated that this base date was of mythological significance, calculated to coincide with the creation of the present world, which is supposed to end on december 21st, 2012 A.C. From that starting point, Long Count dates were recorded with a string of numbers whose value depended on their position in the string. During World War II, Dresden was severely bombed, and the library suffered serious damage.Twelve pages of the codex were harmed and all the glyphs in the upper left-hand corners of the pages were completely erased. Some of the pages were erroneously mixed up and returned in wrong sequence into the protecting glass cabinet. Even so, it is still a "faithful representative of the precocity and elegance of the ancient Maya," according to Salvador Toscano (1912-1949), historian, archaeologist and critic of Mexican art. When Johann Christian Goetze catalogued the "strange mexican book" in 1744, he did not know yet, that he had got hold of one of the only three mayan codices left to the world. Little notice was taken of it until 1796, when an odd but distinctly work appeared in Leipzig, the Darstellung und Geschichte des Geschmacks der vorzüglichsten Völker ("Depiction and History of the Taste of Superior Peoples") by Joseph Friedrich, Baron von Racknitz. In 1810, Alexander von Humboldt published his famous atlas Vues des Cordillères et monuments des peuples indigènes de l'Amerique. One of the plates was showing in absolutely exact detail, five pages from the Dresden Codex. It was first published completely by Edward King, Viscount Kingsborough, in Antiquities of Mexico (1830–48). Kingsborough erroneously attributed the codex to the Aztecs. Not until 1829 did Constantine Rafinesque-Schmaltz (1783-1840) identify it as a Mayan codex. The first scientific facsimile edition of the codex with commentary was made by the director of the Royal Library at Dresden Ernst Förstemann (Leipzig, 1880). This was an early example of a "photographic" process known as "chromolithography". The black and white images were reused for an 1892 edition. Additional commentary appeared in German through 1901. The Förstemann material was republished in Commentary on the Dresden Codex (Mayan Studies Series, No 1). 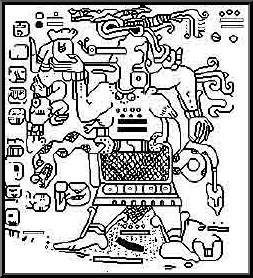 He was the first to discover the Mayan vigesimal counting system and to explain the calendar principles. There were other graphical reproductions published in the first half of the 20th century, most importantly the 1930 edition redrawn by Villacorta & Villacorta, which originally appeared in serial form in a Mexican periodical. While there are a few specific errors in the drawings, it is probably the most serviceable edition and (as a publication that appeared just behind the wire for modern copyright laws) is generally available from a number of sources. The Villacorta y Villacorta material was republished in The Dresden Codex : Drawings of the Pages and Commentary in Spanish (Mayan Studies Series, No 3). The most complete work on the Dresden Codex is the Commentary by Eric Thompson (1972). The reproduction used for the Thompson edition were based on black & white photographs from the earlier Forstemann printing, and were hand colored for this publication. A more widely available recent impression has been published by Fondo de Cultura Económica in Spanish as Commentarios al Codice de Dresde. The most recent facsimile edition of the Codex Dresdensis is the one publisheded in 1975 in Graz (Akademische Druck- und Verlagsanstalt) with comentaries of Helmut Deckert and Ferdinand Anders. Decipherment of Maya writing ist still in progress, but so far linguists have worked out a grid of syllabic glyphs in Maya, as well as a significant portion of logograms. The Maya wrote both logographically and phonetically. Very often logograms have phonetic complements to facilitate the correct identification of the logogram.The story really started with Bishop Diego de Landa, who avidly committed to destroy every Maya book that he could find. Ironically, though, when he was composing his Relación de las cosas de Yucatán, he included a very sketchy and rather erroneous "summary" of Maya hieroglyphics. Apparently, he assumed that Mayas wrote with an alphabet, and so he asked his native informants on how to write "a", "b", "c", and so forth, in Maya. The Mayas, on the other hand, heard the syllables "ah", "beh", "seh"..."atshe" (as "a", "b" and "c" ..."h" would be pronounced in Spanish), and so forth, and naturally gave the glyphs with these phonetic values. So, in a sense, Landa recorded a very small section of the Maya syllabary, and the Mayanist equivalent of the Rosetta Stone.